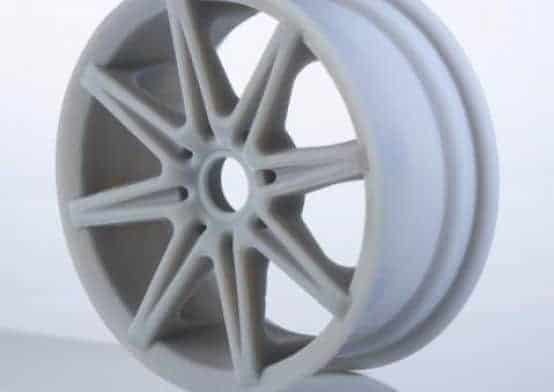 Stratasys’ ambition with the Objet30 Pro is to offer the precision and adaptability of an industrial-grade rapid prototyping printer within a device with physical dimensions nearing those of an inkjet printer or office photocopying machine – a compact workhorse capable of highly detailed prints. We’ve taken a look at the Objet30 Pro to see how well it lives up to these claims. Here’s our take. 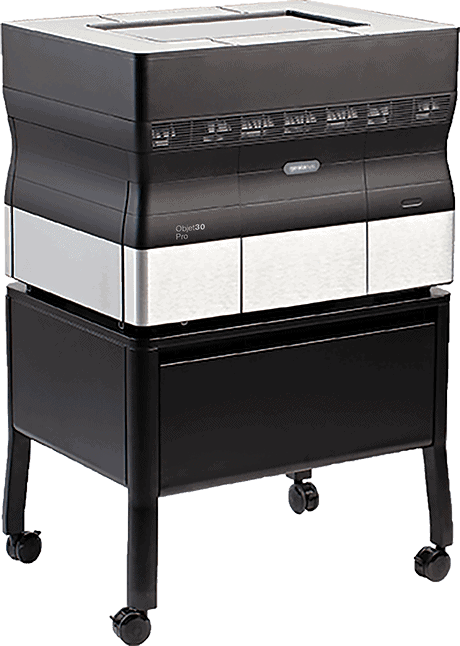 Touted as a desktop printer, the Objet30 Pro has all the allure of a professional grade printer with a sleek black and white color scheme that shapes a rectangular body that interestingly curves inwards vertically towards the center of the unit. 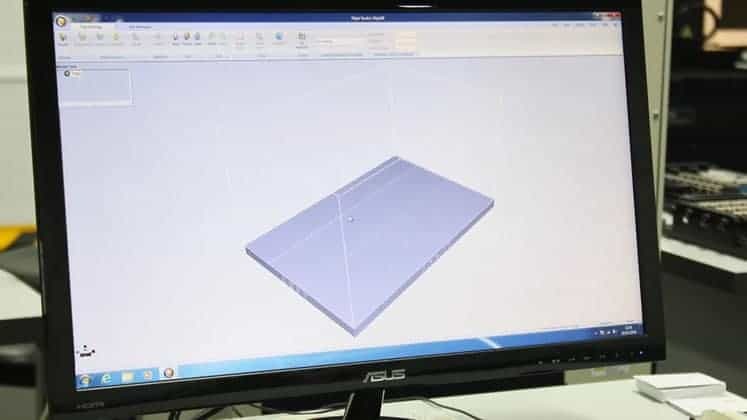 The plastic casing will be familiar to anyone having used a consumer-grade ink printer making it very much at home in a design studio, home office or university alongside similar devices. The total weight of the printer is a robust 106 kg, which apart from making transportation a hassle, ensures near unwavering stability even when the print heads are whizzing away at the highest speed setting. The components are all heavy duty and of the highest quality, positioned for maximized functionality but also a certain aesthetic, mechanical appeal especially when opening the hood and peering inside. The extruder mount can only be described as chunky with one of the most prominent profiles we’ve come across from a printer with this footprint. 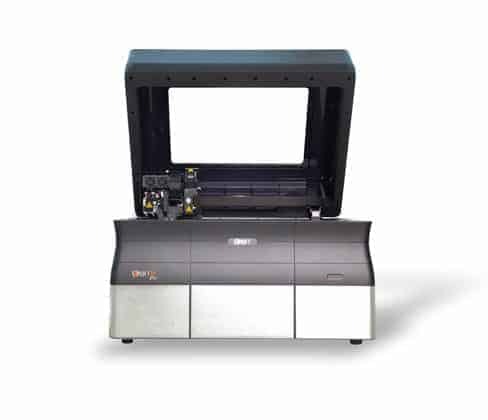 The Objet30 Pro employs Stratasys’ patented PolyJet printing technology, which sits somewhere between typical FDM and precision SLA printers. The process is reminiscent of the inkjets found in standard printers whereby a jet places drops of liquid photopolymer material onto the build plate and then hardens or cures it by shining UV light onto it. This method is rather uncommon with results that offer precision unseen in printers using FDM technology. The build area tallies up to 294 x 192 x 148.6 mm with axis resolutions of 600 dpi, 600 dpi, and 900 dpi for the X-axis, Y-axis, and Z-axis respectively. 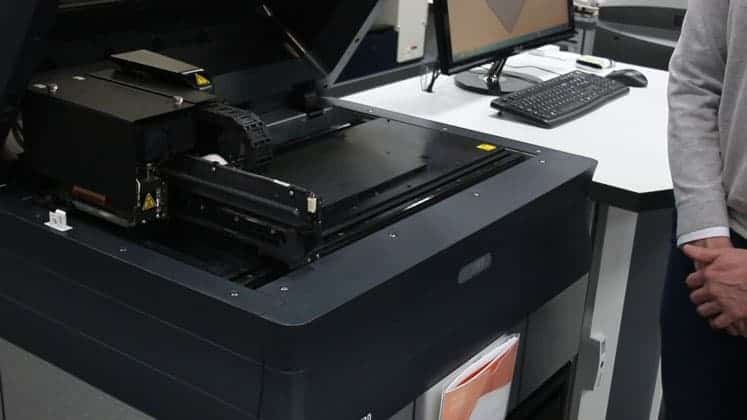 Generally speaking, the Objet30 Pro attains software to real-world print accuracy levels correct up to around 0.1mm, but this vacillates significant waging on the type of model, size, the materials used, and the complexity of the design. The Objet30 Pro has a dual extruder setup; one for printing material and the other for support material, both sitting alongside the UV light that does the curing work. 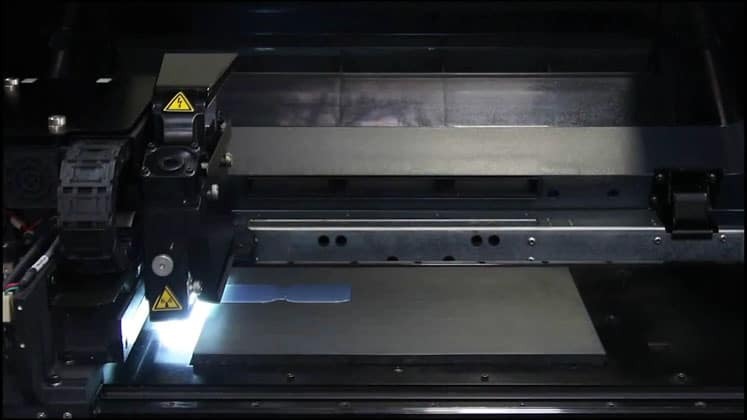 The configuration allows layer resolutions ranging from 16 to 28 microns depending on whether it prints on the high quality or high-speed setting. The precision makes it one of the most detailed printers on the market regardless of cost and is a world away from the 100 microns best of most consumer models. 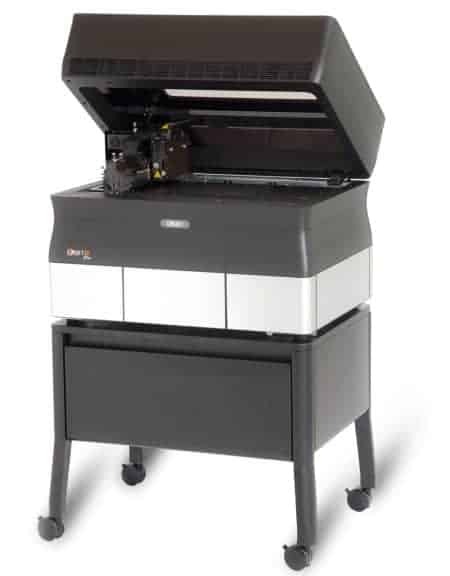 The material support of the Objet30 Pro is where the printer comes into its element with different liquid photopolymers endowed with a range of physical properties for all manner of situations, the only real negative being that only materials sourced from Stratasys are compatible. Rigid Opaque in white, black, gray, and blue allow for high detailed prints that reach the quality level of end products for prototyping. 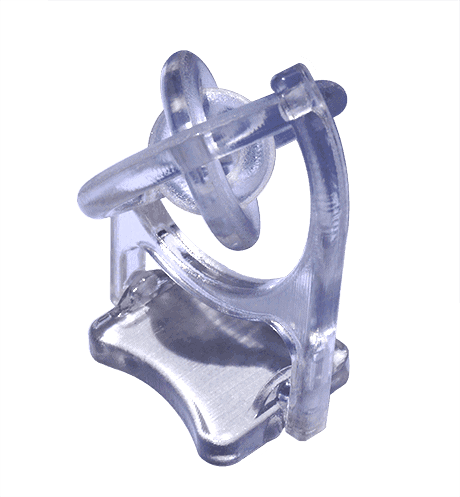 Transparent VeroClear is ideal for fine-modeling used to simulate end-product transparent materials. High-Temperature RGD525 is geared towards functional testing for scenarios where high temperatures, be it air or liquid, are required. Finally, the printer supports DurusWhite Simulated Polypropylene designed for durability and robust usage for example low tolerance hinges and snap-fit products. 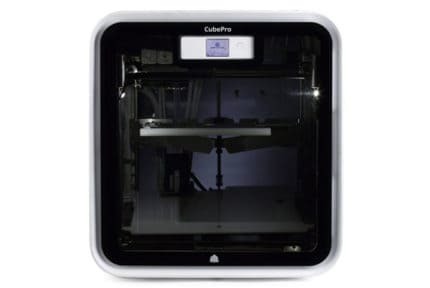 The printer also uses the non-toxic gelatinous FullCure 705 support material that is not only ideal for crafting complex overhangs and the like but is removable via the DT3 Clean Station that ships with the printer. The materials are housed in a convenient slide out draw sitting below the main printing area. Should any of the liquid photopolymer cartridges run dry, the printer has an inbuilt feature that pauses the building process to allow the user to load in a replacement, at which point the device picks up where it left off. Connectivity is limited to a local network via ethernet cable, which is the standard for industrial sized printers that need a connection to multiple workstations. As for software, the Objet30 Pro functions with Stratasys’ Objet Studio that converts any STL or SLC 3D CAD file into a sliced model that the printer can interpret and render. All controls are managed from Objet Studio with no LCD or controls on the printer itself. Functionality ranges from automatic support creation, a range of editing tools, material selection, auto-positioning, maintenance, and the like. Compatibility is reserved for Windows systems. Overall, Objet Studio is as intuitive as it is versatile and rivals open source slicers such as Simplify3D. 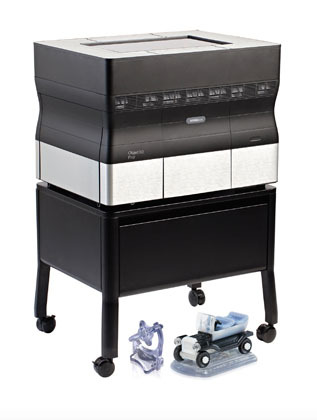 The Objet30 Pro arrives fully assembled with no installation other than fitting the liquid photopolymer cartridges into the loading tray and loading the roller bath/blade assembly into its berth below the build plate. The package includes the Objet30 Pro waste containers, roller bath assembly, wiper blade assembly, sanding sponge, ethernet cable, nozzle ruler, loupe, tool kit (scraper, Allen key, mirror, spatula), cleaning cloths, transparency sheets, pink paper, nitrile gloves, scale, spray bottle, support cleaning fluid, model cleaning fluid, user guide notebook, USB flash drive, and a stylus pen. Due to its complexity, the Objet30 Pro does require quite a bit of maintenance from cleaning the innards, replacing printheads, emptying waste containers, but nothing a versed lab or office technician couldn’t handle. For a price tag nearing $20,000, we wouldn’t accept anything short of exceptional, and the Objet30 Pro fits the bill. Prints are more or less flawless, and the array of printing materials allow a varied selection of models. All our test prints were smooth, precise, and showed a level detail usually found in pre-assembly line models. We encountered no issues whatsoever with the printing process. The results are suited to all manner of ends from engineering, consumer goods, low tolerance prototyping, end-user small scale manufacturing, dentistry, electronics, medical, and of course design. Virtually any industry can benefit from the quality of the prints produced by the Objet30 Pro. Objet Studio is packed with options and is incredibly easy to use even though it controls such a powerful beast of a machine. As you’d expect from Stratasys, the support is of the highest caliber with a rich vault of guides, tutorials, and videos peppering its web site alongside the Stratasys Service Offering which includes on-site technical service and maintenance, part replacement, user training seminars, and discounts on accessories among other benefits. Additionally, technical support teams are available throughout the world through phone, email or in person support. The printer itself ships with a standard one-year warranty. When reviewing leviathan grade printers with all the bells and whistle it is hard to produce a verdict other than excellent, but then again this is very much expected from the associated price tag. The Objet30 Pro follows suits, and if you’ve got the budget to match (including maintenance and on-going production costs), then you quite simply can’t go wrong with this model. 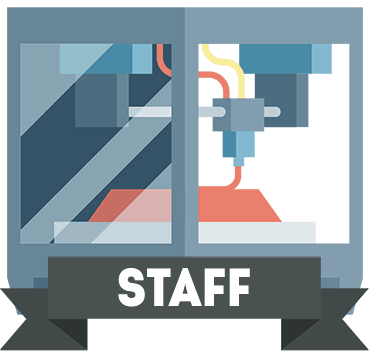 It comes highly recommend for any professional context in need of a reliable, versatile, and precision-oriented 3D printer that won’t take up too much space yet deliver the same level of quality as much more expensive alternatives. The Objet30 Pro continues Stratasys rich legacy as one of the best manufacturers on the market. 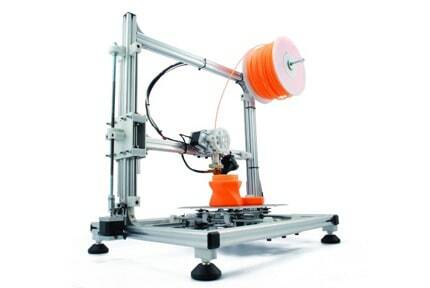 Powerful, compact, precise, and versatile, we are hard pressed to find anything wrong with this excellent 3D printer.